This wildly imaginative collection presents the misadventures of unlikely heroine Eleanor Stoddard as she tries to lead an exemplary life but finds that things just keep going awry. In the summer after sixth grade, she dreams of being as courageous as Anne Frank. As a teenager, her sudden devotion to Catholicism coincides with her crush on a nun. As a suburban housewife who suspects her husband of having an affair, she imitates Nancy Drew to try to solve her own personal mystery. And as a middle-aged woman, she embarks on a trek through Central America accompanied by a rescued laboratory gorilla. While Eleanor makes her way through a whirlwind of adventures with life and love in which she is constantly reinventing her identity and rethinking her priorities, she manages to become a first-rate student, a published poet, and a loyal mother. 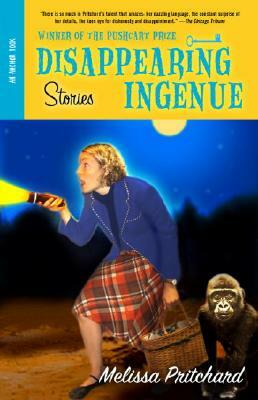 Each story offers a glimpse into her familiar and charmingly odd journey, and she comes hilariously to life in these disarming tales. Melissa Pritchard is the author of two short story collections, The Instinct for Bliss and Spirit Seizures, and two novels, Phoenix and Selene of the Spirits. Pritchard was awarded a Pushcart Prize for “Funktionslust,” which appeared in The Paris Review. Her story “Salve Regina” was included in Prize Stories 2000: The O. Henry Awards. Among numerous other awards, she has received the Flannery O’Connor Award, the Janet Heidinger Kafka Prize, and a Howard Foundation Fellowship from Brown University. She is Director of the M.F.A. Creative Writing Program at Arizona State University and is on the faculty of Spalding University.